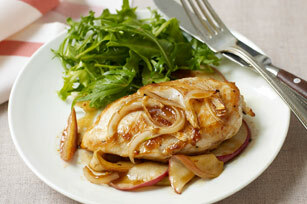 Here's a new twist on chicken, not to mention a yummy way to get that apple a day into your diet. Lightly brown the chicken in lemon juice. Add chopped apple and evenly coat with a mixture of apple cider vinegar, lemon juice, stevia, cinnamon, cayenne and pinch of salt. Put in small baking dish and add additional vinegar and lemon juice. Serve with the rest of the apple in thin slices on the side.